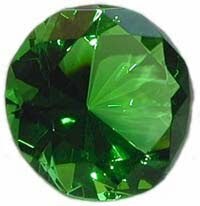 Emerald or Marathakam is the gemstone assigned to Nakshatras Aslesha, Jyeshta and Revati. Ashlesha is also known as Ayilyam and Jyeshta is known as Kettai or Thriketta. Marathakam or Panna is associated with Navagraha Budha or Mercury. Navratnas are worn by people who believe in astrology to solve horoscope or janma kundali related problems. Wearing the Gemstone is believed to help in gaining happiness, wealth and it also helps in leading a healthy life. It is believed that if people born in Ashlesha, Jyeshta and Revathi Nakshatras wear Navratna Emerald they will be blessed with good intellectual powers. They will also be blessed with good memory power.